The little seaside town of Dawlish has some rather distinctive features which make it a perfect setting for one of the most distinctive catering styles possible. For hog roast Dawlish turns to us because this is a place that likes to do things just a little bit differently. 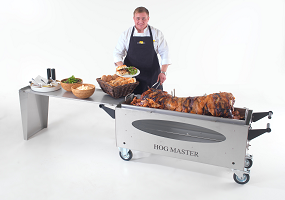 For those of you not in the know, hog roasting is the age-old technique whereby meat is roasted on a spit over an open flame. This technique may be ancient, but our machines and methods are completely up-to-date and allow you to enjoy flame-roasted meat cooked to perfection every time. Dawlish is famous in the local area for its black swans, introduced to the town over a hundred years ago and so distinctive that the black swan ended up as the town’s emblem. The area is popular with birdwatchers due to an abundance of other interesting waterfowl that live along the waterway that winds its way through the pleasure gardens. We love birds too, but because we are hog roast Dawlish caterers we know that some birds are very tasty to eat. You see, we don’t just prepare succulent roasted pig but all manner of meats and tasty dishes. Another of our specialties is roast chicken or roast turkey. Like the traditional hog roast, we roast poultry on the spit. Turkey is a great choice for traditional seasonal fare and both chicken and turkey are also a great choice for smaller parties or groups. For larger gatherings we offer a variety of menu and catering options. We are also the best option for hog roast hire Dawlish townsfolk could ask for. Our popular menu options are obviously built around the meat itself. Whether you choose to stick with the popular hog roast or whether you choose beef, poultry or lamb, you can be sure that the meat will be fresh and juicy and cooked until it is tender and succulent. We have traditional sauces to accompany all of our meats. Apple sauce goes perfectly with pork for example, and we have cranberry, sage and onion stuffing, mint sauce and horseradish sauce for the turkey, chicken, lamb and beef respectively. Obviously you will want a selection of sumptuous sides to accompany the main dish. We can prepare filling and simple sandwiches, new potatoes and salad or even a four-course meal that comes with appetisers, canapés and chocolate puddings. If you are hosting a wedding or other special occasion we can provide all of the catering, including drinks service and we can bring crockery, glasses and cutlery. We set everything up, cook the food on site and then clear everything away, meaning that you don’t have to lift a finger or worry about a thing. We are available for bookings every day of the week, for indoor and outdoor venues, and we can put on a delicious spread no matter what the weather. Give us a call and we will be more than happy to talk over all of the available options with you. Another sight that makes Dawlish distinctive is the railway line that runs right along the beach. The town has been a popular tourist destination since the 1930s when the railway line was built and the striking railway means that people continue to flock to the town. If you want to enjoy your food outdoors, or if you want to cook for your family and friends as part of a weekend getaway or even just for something a bit different, why not consider hog roast hire Dawlish? Hiring one of our roasters means that you get to enjoy the pleasure of cooking your own meat – don’t worry, we will show you how! You can also buy your meat fresh from us when you rent out the machine or you can just rent the machine from us and buy the meat and other ingredients elsewhere. We really are that flexible, all you have to do is contact us and tell us how we can help you. We think that everyone should experience the extraordinary pleasure of eating slow-cooked and delicious meat right off the spit (but don’t worry, we can also cater for any vegetarians at your gathering). That’s why for many years now we have been committed to providing the best catering service possible to the local area, whether that is catering for fancy parties or small groups, or by showing people how to use our rental grills. Your satisfaction is our priority and once you have tasted our food we know that you will want to tell everyone you know about us.